In today’s Wall Street Journal “Sightings” column, I pay tribute to the great cabaret singer Wesla Whitfield, who died last Friday. Here’s an excerpt. Wesla Whitfield, who spoke those words to me, died last week at the age of 70 at her home near San Francisco. Like most of her cabaret colleagues, she was unknown to the general public, but she did manage to perform at Carnegie Hall and the White House and be profiled on “CBS Sunday Morning,” and she was for many years an Oak Room regular. I always made time to go hear her whenever and wherever she appeared in New York, for her silvery-voiced singing was everything that cabaret ought to be: playful and sly, daring and free, musically immaculate, unsparingly emotional. While she wasn’t a jazz singer in the ordinary sense of the word, preferring to stick tight to the tunes of the standards that she favored, she knew how to swing and was wholly at ease with the playing of the jazzmen who worked with her. None suited her better than Mike Greensill, her accompanist and husband, a superbly tasteful pianist who loved nothing more than to craft imaginative settings for her vocals. 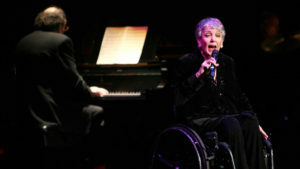 It was also Mr. Greensill’s job to carry Ms. Whitfield on and offstage, for she was confined to a wheelchair and usually sang her gigs perched on a stool placed in the bend of his piano. One night in 1977, a pair of young muggers shot her in the spine on the streets of San Francisco. They were never caught, and she never walked again. Nor did she repine: It was after the shooting that she blossomed as a musician…. One of Ms. Whitfield’s most striking qualities was her ability to touch the listener without resorting to the hair-tearing overstatement that is the mark of too many cabaret singers. She told her tales of love and loss with an understated straightforwardness that left it to you to plumb the emotions of which she sang….